I mentioned in a previous post that I have a fondness for monkeys and robots. Here is a papertoy set with both! :) This pair is from the "Brickboy" papertoy series. Together they are a set titled "Monkey vs. Robot". What I like best about the battling duo are the whimsical details like the robot's escape hatch on top and the monkey's bare bottom. These easy to build papertoys were designed by Sjors Frimbach, Netherlands, 2005. UPDATE 8/10/2011: Frimbach is no longer posting his paper toys. An alternate site to download this template may be found here. 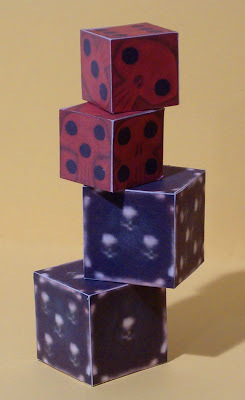 Here are two unrelated pairs of papercraft dice with skulls. The red pair on top are the Oogie Boogie's dice. Oogie Boogie is a villian from the 1993 Disney movie, The Nightmare Before Christmas. Oogie also is a reoccurring character in the Kingdom Hearts video game series. The black pair of dice are a weapon called "Demon Dice" from the video game American McGee's Alice. When these dice are cast in the game a demon is summoned who then attacks your enemy. The Oogie Boogie Dice are by Robert Nava, USA, 2008 and can be found here. The Demon Dice are by Rick the Webdude, USA, 2007 and can be found here. This has to be my favorite build out of the five papercraft VW Beetles I have completed so far. All the parts had a very good fit and whoever drew the template added some nice touches of shading. I was unable to determine who created the template or how old it is. The two page, sixteen part template is available on this web page. There you will find several other Beetle templates in addition to this one. PS. If you missed the previous Beetle builds in this seven part series you can view them here. 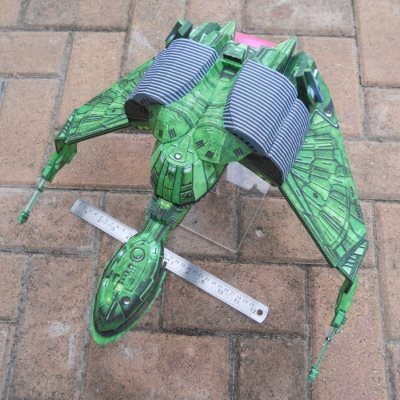 I tried to keep the joints and fold lines to a minimum which can make fitting the parts together tricky if you are not careful with the accuracy of your build. For best results start building from the center and work your way outward. This fascinating globe puzzle has been on my "to do" list for a long time, but I can't seem to find the time to build it. 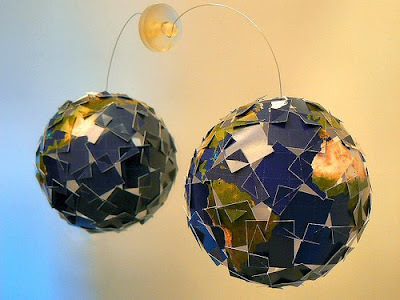 The puzzle is made out of 60 rectangular pieces which are slotted together and held in place with a small amount of tape to form a dodecahedron globe. The creator of the puzzle has a template and easy to follow instructions posted here. Using the same construction technique, the author has also created a "panorama sculpture" in which a panoramic photograph has been mapped onto the globe instead of an image of the Earth. The results are very cool. The panorama sculpture can be seen here. 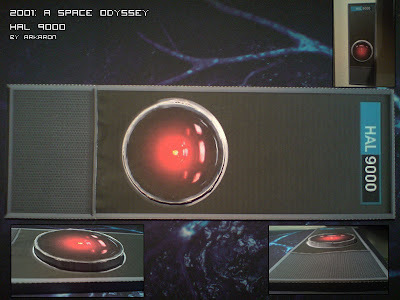 Here are some nice build photos of my HAL 9000 Interface model. These photos came from Arkaron at deviantART. 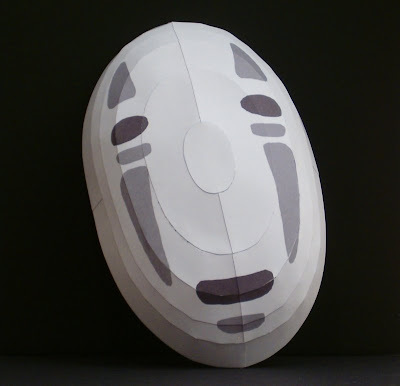 More of his papercraft builds can be seen here, including several builds of Zelda papercraft. Good job Arkaron! 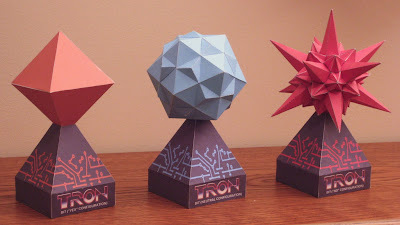 Based on some comments I received after posting my Tron Bit papercraft design, I have created some alternate templates. First, I have re-colored templates of the Yes Bit. For the original Yes Bit template I had sampled the color from a digital image of the Bit which gave me a dark orange color. Some Tron fans feel the Yes Bit's true color is closer to yellow than orange, so I searched through other digital images from the movie until I found a more yellow image and then sampled it for the re-colored template. The image and the resulting model are shown on the left. It is still a little orange in my opinion, but much closer to yellow than the original model. Secondly, I have created versions of the original temples with all fold lines eliminated except for the fold lines at the gluing flaps. This will allow more experienced papercrafters to build cleaner looking, lineless models if they desire. A zip file of the re-colored Yes Bit templates (with and without fold lines) may be downloaded here. A zip file of the three original templates without fold lines may be downloaded here. If you missed the original post for the lined templates of the Bit, you can see it here. Here is a simple Convertible Beetle papercraft with only three parts. 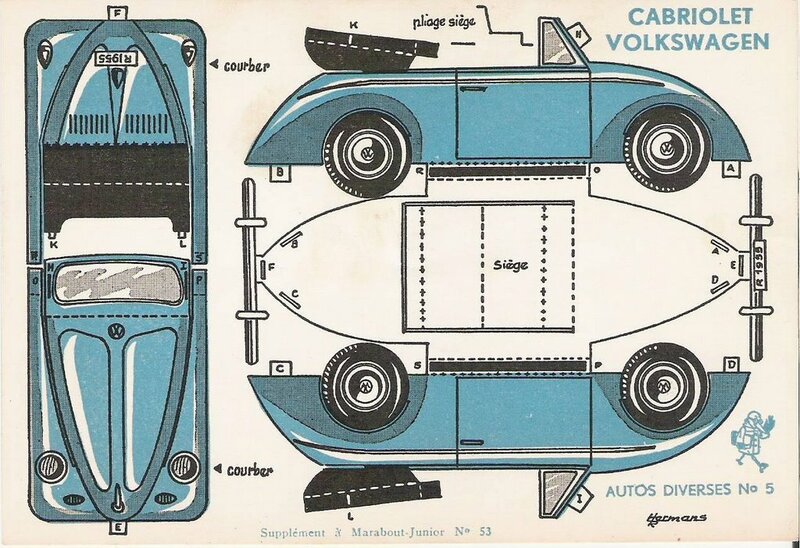 Judging by the notes on the template, the model must have originally appeared as a supplement in a Marabout-Junior book. Marabout-Junior was an imprint of Belgian publisher Marabout that featured adventure novels for young adults. It is likely that this paper model was created in the 1950's or 1960's making it one of the oldest papercraft designs I have built to date. A scan of the template can be found here. Here are some cool miniature Star Wars papercraft made from Paris Metro tickets. I really admire tiny papercraft builds like this because I don't have the patience to attempt something this small! Want to give it a try but don't have a Metro ticket? No problem. The designer has a photo of a Metro ticket posted including the ticket's dimensions. Both the X-Wing Fighter and the Millennium Falcon models were designed by Hubert de Lartigue, France, 2005 and can be found here and here. UPDATE: Lineless templates and a re-colored template of the Yes Bit are available now here.